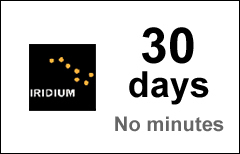 The Iridium 30-day extension voucher extends validity of your existing Iridium prepaid account by 30 days. Purchase this voucher when your Iridium account has sufficient balance that needs to be extended due to approaching expiration date. Compatibility: rechargeable Global and GO! plans ONLY! SAVE in per month costs by ordering longer extensions! SATTRANS Accounts Only! You can use this prepaid voucher only if you have an Iridium prepaid account (SIM) supplied and activated by SATTRANS. We cannot reload minutes on other providers' SIM-cards. If you don't have an account with Sattrans, you can always purchase and activate a new Iridium Prepaid Plan. Returns and Cancellation. You can request a cancellation only if your voucher has not yet been loaded to your Iridium account. Prepaid vouchers which have been loaded to an Iridium account are NOT returnable or refundable, no exceptions! Maximum Account Validity. The maximum validity of an Iridium prepaid account cannot exceed 2 years from the date of the most recent voucher reload. All unused minutes on your existing Iridium prepaid account will be preserved and rolled over ONLY if a new voucher is purchased AND deposited BEFORE the expiration date of the current voucher. 3 years Maximum Age Limit.Iridium prepaid minutes that have been carried over for more than three (3) years will be expired from prepaid account balances on a daily basis as they reach their Maximum Age Limit. More information.